This is my sixth Christmas in the parish (where have those years gone?) and I would like to wish parishioners every blessing of the feast and a very happy Christmas! I am grateful for the help and support I receive throughout the year, and as they say, ‘I couldn’t do it without you!’. Particular thanks to our extra-ordinary ministers of Holy Communion, Readers, those who lead the Children’s Liturgy of the Word, Servers, Musicians, cleaners, the SVP, those who arrange the flowers, sacristans, welcomers, those who help with refreshments after Mass, counters, collectors and singers. Thanks also for the many cards and gifts I have received - they are very much appreciated. Thank you to all involved in the Carol Service held last week. It was truly a great celebration and reflected a lot of hard work and dedication. Many thanks. 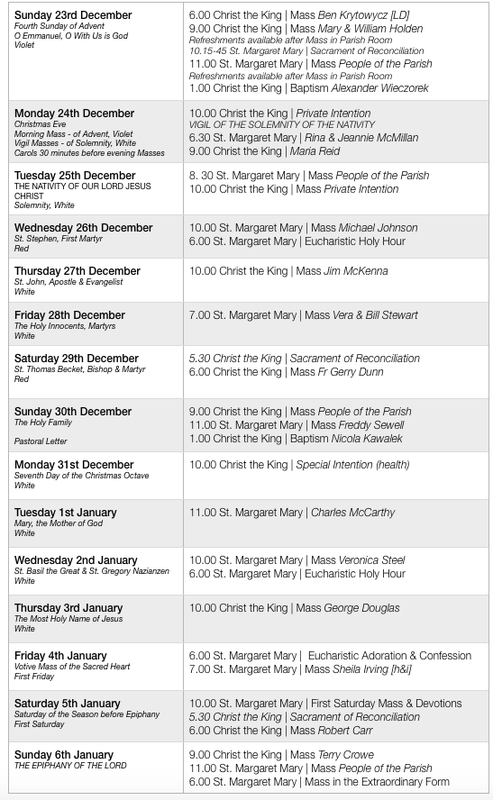 Please invite members of your family and friends to attend Mass this Christmas. Carols will be sung 30 minutes before the Masses on Christmas Eve. Fr Michael would be grateful for prayers, especially the Holy Rosary for a private intention. 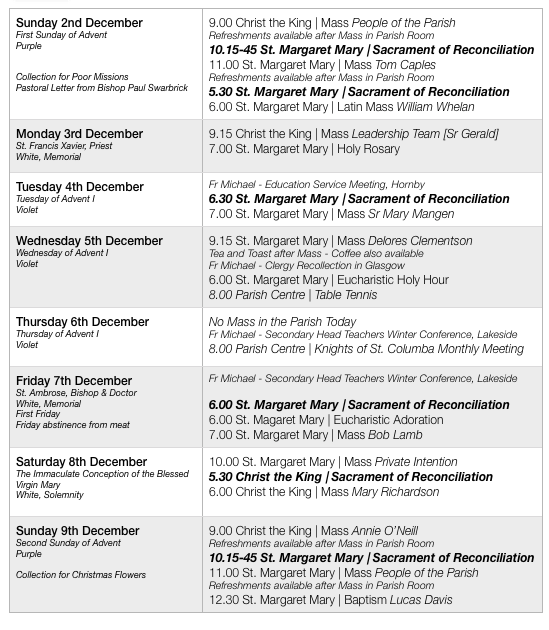 Please pray regularly for this intention over the coming weeks. There is a meeting of the Deanery Pastoral Council scheduled for 10th January at 7.45 pm at St. Bede’s Presbytery. Could parish representatives please let Fr Michael know their availability to ensure a good representation at this meeting. The meeting will outline a number of important deanery initiatives for young people and also a deanery wide Word on Fire! Engage initiative. Please begin to bring in Red Mission Boxes for emptying after Christmas [from beginning of January]. Carlisle Passion Play 2019 - Get involved! The Carlisle Passion Play will take place on Saturday 13 April in the Town Hall Square. Two hour-long performances at 11.00am and 2.00pm. A dramatic outdoor performance in modern idiom portraying the betrayal, death and resurrection of Jesus Christ. Are you interested in acting, being part of the crew, volunteering, stewarding? Writer and director, John Davies of Classic Theatre Cumbria, is looking for people to perform and also support the performance in wardrobe, stage set etc. More information and to register your interest: carlislepassionplay.org, info@classictheatrecumbria,co,uk or Tel: 07970 673236. This is unique to our city, an opportunity to take part in a type of theatrical presentation whose origins lie in the liturgical drama of the 10th century. With over 20 speaking parts, a crowd involving adults, children and live music, it promises to be a memorable experience for performers and audience alike. St Margaret Mary SVP would like to thank parishioners, staff and students of The Newman Catholic School and Cyril & Methodius School of Evangelisation Polish Community for the wonderful response to our food parcels appeal. Also many thanks for those who helped pack and deliver the parcels to families in the local community. Just a gentle reminder: if you have a specific date you would like to keep, then please provide plenty of notice, i.e. at least one month in advance. Fr Michael does his best to allocate Mass intentions for a specific date when requested but sometimes these dates have already been allocated. In those cases, he allocates as near a date as possible. We are changing the way the newsletter is distributed via email in the New Year and will also be beginning a new evangelisation programme via Word on Fire! Engage. SIGN UP NOW: For updates from the parish via email, such as our weekly newsletter. Please sign up at https://app.flocknote.com/StHerberts Then sign up under the parish you associate with - 'Sacred Heart of Jesus'. It takes two minutes to do and you will also receive wide ranging and engaging material!! ALL FREE!! You will not be inundated with emails!! Our diocesan pilgrimage takes place 20-27 July; flights from Manchester airport. Brochures, booking forms and a poster are available via http://www.tangney-tours.com/pilgrimages/lourdes/diocese-of-lancaster-2019. For young people: Travel to Lourdes by coach with other young people from our diocese, 25 July – 3 August. Open to ages Year 10+, 4-star hotel, £585. For more information, to book online or download the poster or booking form, please see: www.castleriggmanor.co.uk/events-whats-on. We haven’t had a parish pilgrimage for a while - how about joining this pilgrimage to Lourdes? First Holy Communion will be celebrated in the Parish on Sunday, 28th April 2019 [the Second Sunday of Easter]. Catechesis for candidates will begin on Thursday, 17th January 2019. Enrolment forms will be available in both churches after Christmas for parents who would like their child to make their First Holy Communion next year. One of the best ways to prepare for Christmas is to go to Confession and make a new start with our Blessed Lord. There are many opportunities to make use of this Sacrament this week in the parish. What’s stopping you? The Annual Carol Service will take place at Christ The King Church at 6.00 pm on Sunday 16th December. Please note the earlier time; this is to make it more convenient for families to attend. The Service will be followed by mulled wine and mince pies in the Parish Room. Please make every effort to attend. Why not come along and join us on Tuesday 18th December to sing Christmas Carols for the residents of Pennine Lodge. We meet there at about 5.50 pm. All very welcome. Attendance 46 + 60 + 104 = 210. Offertory Contribution £461 + £250.60 = £711.60. Thank you. If you’re looking for a new Christmas tradition for you and your family, we’ve got an idea that is not only fun to do but will teach your little ones some special lessons over the festive season. Everyone loves advent calendars to count them down to Christmas Day. Most children adore receiving one at the beginning of December because it gets them excited for Fr Christmas coming and every surprise that they open on the way is a promise of what’s to come. But if you want to try something a little different this year, you can create an advent calendar that you and your children put something into every day instead of taking something out. Reverse advent calendars work by you filling them every day with items of food or clothing that can then be taken to a food bank or charity in order to help those less fortunate that are struggling at Christmas time. After gathering helpful items all month, items can be brought to Christ the King Church for transfer to the food bank. Not only is this a fun thing for the whole family to do together, from creating the advent calendar structure itself to picking the goodies to go in it, it more importantly teaches your children the importance of helping others and seeing the bigger picture at Christmas. Please pray for the repose of the soul of Fr Bob Halshaw’s mother [many of you will know Fr Bob through your work at Coniston] who died on Saturday 1st December. May she rest in peace. Please also pray for Fr Aelred Grugen, who is very ill in hospital in Scotland. The Carlisle Passion Play will take place, on Saturday 13 April, in the Town Hall Square. Two hour-long performances: 11.00 am and 2.00 pm. A dramatic outdoor performance in modern idiom portraying the betrayal, death and resurrection of Jesus Christ. Are you interested in acting, being part of the crew, volunteering, stewarding? Writer and director, John Davies of Classic Theatre Cumbria, is looking for people to perform and also support the performance in wardrobe, stage set etc. More information and to register your interest: carlislepassionplay.org, info@classictheatrecumbria.co.uk or Tel: 07970 673236. Just a gentle reminder: if you have a specific date you would like to keep, then please provide plenty of notice, i.e. at least one month in advance. Fr Michael does his best to allocate Mass intentions for a specific date when requested but sometimes these dates have already been allocated. In those cases he allocates as near a date as possible. The annual SVP Mass with Anointing of the Sick will be celebrated on Tuesday 11th December at 2.30 pm. There’ll be a bit of a ‘do’ afterwards in Harraby Catholic Club. All are welcome. There will be a voluntary collection on Sunday 9th December to offset the cost of flowers to decorate the Altar at Christmas. The Annual Carol Service will take place at Christ The King Church at 6.00 pm on Sunday 16th December. Please note the earlier time - this is to make it more convenient for families to attend. The Service will be followed by mulled wine and mince pies in the Parish Room. Please make every effort to attend. 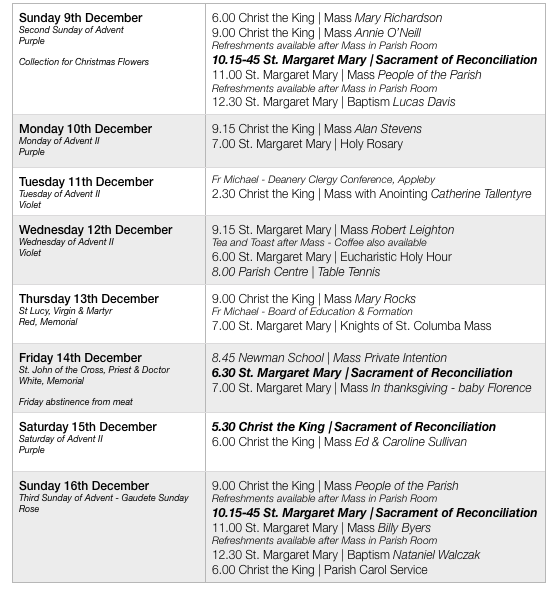 After Mass on Sunday 9th December at Christ The King, we will be preparing the church for Christmas. We would be grateful for any help you could give us. Thank you to all who have supported the collection of food through donations to contribute to parcels distributed to local families in need. The SVP are grateful for your continued support for this project. Not only is this a fun thing for the whole family to do together: from creating the advent calendar structure itself; to picking the goodies to go in it, it more importantly teaches your children the importance of helping others and seeing the bigger picture at Christmas. Please pray for the repose of the soul of Fr Bob Halshaw’s mother [many of you will know Fr Bob through your work at Coniston] who died on Saturday 1st December. May she rest in peace. Please also pray for Fr Aelred Grugen who is very ill in hospital in Scotland. The Carlisle Passion Play will take place on Saturday 13 April, in the Town Hall Square. Two hour-long performances: 11.00 am and 2.00 pm. A dramatic outdoor performance in modern idiom portraying the betrayal, death and resurrection of Jesus Christ. Are you interested in acting, being part of the crew, volunteering, stewarding? Writer and director, John Davies of Classic Theatre Cumbria, is looking for people to perform and also support the performance in wardrobe, stage set etc. More information and to register your interest: carlislepassionplay.org, info@classictheatrecumbria,co,uk or Tel: 079706 73236. This is unique to our city, an opportunity to take part in a type of theatrical presentation whose origins lie in the liturgical drama of the 10th century. With over 20 speaking parts and a crowd involving adults, children and live music, it promises to be a memorable experience for performers and audience alike. Thank you to all who supported our young parishioners who were confirmed by Bishop Paul last Sunday. Thanks especially to all who worked tirelessly to get the church ready for the celebration, our musicians and singers and all those who contributed to the shared lunch. At Mass 53 + 40 + 215 = 308. Offertory contribution: £355.54 + £421.15 = £776.69. The Festival Choir continues on Sunday evening. We would love to have some new members to swell our ranks. You don't have to be musical and everyone can sing. Sessions are from 7.00 pm to 8.30 pm at Christ The King. Young people would be especially welcome. Please give it some thought. First Holy Communion will be celebrated in the Parish on Sunday 28th April 2019 [the Second Sunday of Easter]. Catechesis for candidates will begin on Thursday 17th January 2019. Application forms are available in both churches for parents who would like their child to make their First Holy Communion next year. Once again we will be sending out food parcels before Christmas to local families in need. Tinned meat and fish and toiletries are especially welcome. Please check dates on tinned goods. We aim to deliver goods in the week beginning 10th December. Thank you once again for your continued support. Parishioners are warmly invited to a talk on the Wisdom Writings given by Bernard Greaves at the Haydock Centre (St. Catherine’s Penrith) on the evening of Thursday 6th December at 7.30 pm. If you own a Jerusalem Bible, please bring it with you. Reverse advent calendars work by you filling them every day with with items of food or clothing that can then be taken to a food bank or charity in order to help those less fortunate that are struggling at Christmas time. The Annual Carol Service will take place at Christ The King Church at 6.00 pm on Sunday 18th December. Please note the earlier time; this is to make it more convenient for families to attend. The Service will be followed by mulled wine and mince pies in the Parish Room. Please make every effort to attend. One of the best ways to prepare for Christmas is to go to Confession and make a new start with our Blessed Lord. 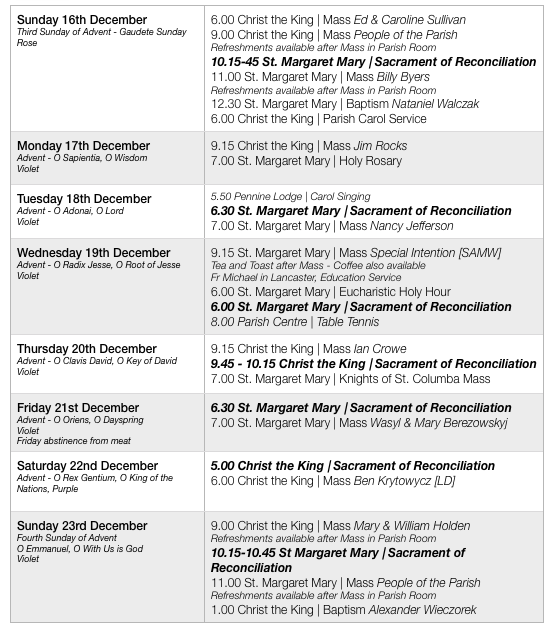 There are six opportunities to make use of this Sacrament this week in the parish. What’s stopping you? This weekend, a pastoral letter from Bishop Paul Swarbrick will be read at all Masses. Please note the extra Mass on Saturday morning, in honour of the solemnity of the Immaculate Conception of the Blessed Virgin Mary - please come along! Bishop Paul Swarbrick will celebrate the Sacrament of Confirmation for the parish during the 11.00 am Mass this weekend. Congratulations to the 13 candidates who will receive this sacrament and complete initiation into the church this weekend. Aid to the Church in Need encourages us to keep Wednesday 28th November as ‘Red Wednesday’ by wearing red to highlight the plight of persecuted Christians throughout the world. For more information visit https://acnuk.org. Christ the King on Tuesday 27th November. The Festival Choir continues on Sunday evening. We would love to have some new members to swell our ranks. You don't have to be musical and everyone can sing. Sessions are from 7.00 to 8.30 pm at Christ The King, young people would be especially welcome. Please give it some thought. All ladies are invited to an Advent Day of Prayer: A Journey with Mary & Joseph, led by Fr Nyagasaza Bideri, on Saturday 1 December from 10.30 am - 3.30 pm, at Xaverian Missionaries Spirituality Centre, 169 Sharoe Green Lane, Preston PR2 8HE. Cost - £5. Tea & coffee provided; please take a packed lunch. For more information and / or to book, please phone: 01772 715495. The Cor et lumen Christi community, Wigton, is hosting this conference from 24-25 November, at St Walburge’s Hall, Preston PR2 2QJ. Donation only. For details, take one of the flyers in the foyer, see the poster, visit www.coretlumenchristi.org or e-mail stcuthberts@coretlumenchristi.org. Caritas Salford is the lead Catholic agency working with the Government to promote the Community Refugee Sponsorship Scheme. In conjunction with RESET Communities and Refugees, St Augustine’s is hosting a presentation on Thursday 29 November from 6.30 pm - 7.45 pm in St. Augustine’s parish Social Room. All are welcome. If you would like to make a donation towards the building cost, this can be made via cheque [‘Newman Chapel Fund’] or in cash. Please enclose in an envelope marked ‘Newman Chapel Fund’. Holy Mass will be offered regularly at Newman School for the intention of benefactors. The total now stands at £9,210. If you would still like to make a donation, please feel free to do so. Catholic Singles is an organisation which helps single Catholics of all ages (over 18 years) meet other single Catholics, either one to one or through social events. For further information, visit www.catholicsingles.org.uk or Tel: 0161 941 3498. Congratulations to Fr. Christopher Loughran, parish priest of Our Lady of Eden, who will be invested as a Canon of Lancaster Cathedral on Tuesday 27th November.